As you all know Christine Bellow aka The Stampin' Ninja is my upline and one of my best friends! She is super creative, has a huge heart, and is pregnant with her 4th child (which is also my godson). *insert huge smiley face here* She looks fabulous doesn't she!?! Me and our other friend Sandra, threw her a baby shower aka Christine's Mustache Bash. She loves all the mustache items that are out there for little boys so this was the perfect theme! I wanted to make a fun shower favor to hand out to the guests as a special little "thank you" for coming. I searched and searched and searched and then I found it! I went to the Etsy store of "That Party Girl" and explained to her the type of shower we were having and that it had to look a bit vintage and the colors would be Pool Party and Early Espresso. Am I the only one that describes colors with the Stampin' Up! names? Probably not :) This is what she came up with and it was a HUGE hit! This is a wrapper that we put around Hershey's chocolate bars and who doesn't love chocolate!?! 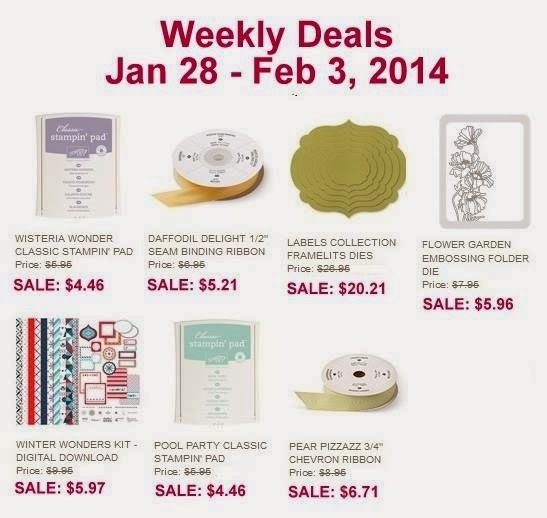 Don't forget new Weekly Specials were released this week and I think my favorite item on this list is the Labels Collection Framelits Dies!